Can you see that smell? In the animal- and insect-kingdom, communication is made through an invisible world of scents. By exploiting infrared technology, researchers at Rockefeller University just made that world visible. With the ability to see smells, these scientists now show that when fly larvae detect smells with both olfactory organs they find their way toward a scented target more accurately than when they detect them with one, just like humans can see better using two eyes or ears, instead of one. 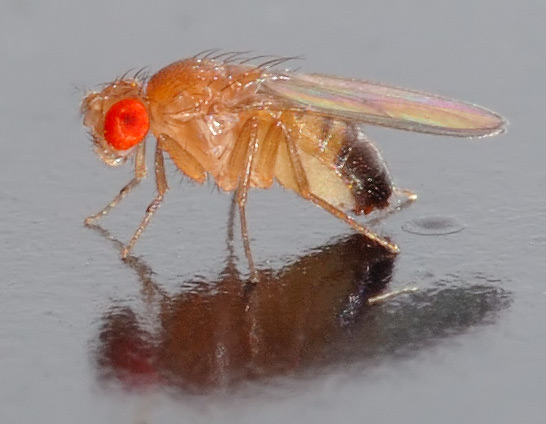 By genetically manipulating flies to express odorant receptors in one olfactory organ or both, they show that the brains of fruit fly (Drosophila melanogaster) larvae not only make use of stereo cues to locate odors but also to navigate toward them — a behavior called chemotaxis. To study this behavior, it had to be figured out which direction the larvae move with respect to the source of the odor. But since odors are invisible, the researchers could neither predict how the flies would move in relation to these scents nor guess whether the odors were concentrated in patches or along a gradient. To complicate matters, odors whisk to and fro at the mercy of the slightest stir, making it impossible to determine their concentrations at particular locations. In collaboration with the researchers in Thomas P. Sakmar’s Laboratory of Molecular Biology and Biochemistry, they used a novel spectroscopic technique that exploited infrared light to create environments where they could see, control and precisely quantify the distribution of these smells. Observing the animals’ behavior, they found that although animals with one functional nose or two were both able to sense odors, only the ones with both olfactory organs working accurately navigated toward the odor source. « I see, I see … strawberries!